A 24-year-old Singaporean man has been charged after the car he was driving collided with another car in the Australian state of Victoria on Tuesday (May 24), leaving two of his passengers in critical condition. Speaking to The Straits Times on Friday (May 27) afternoon, a Victoria Police spokesman said the man faces four counts of dangerous and negligent driving. 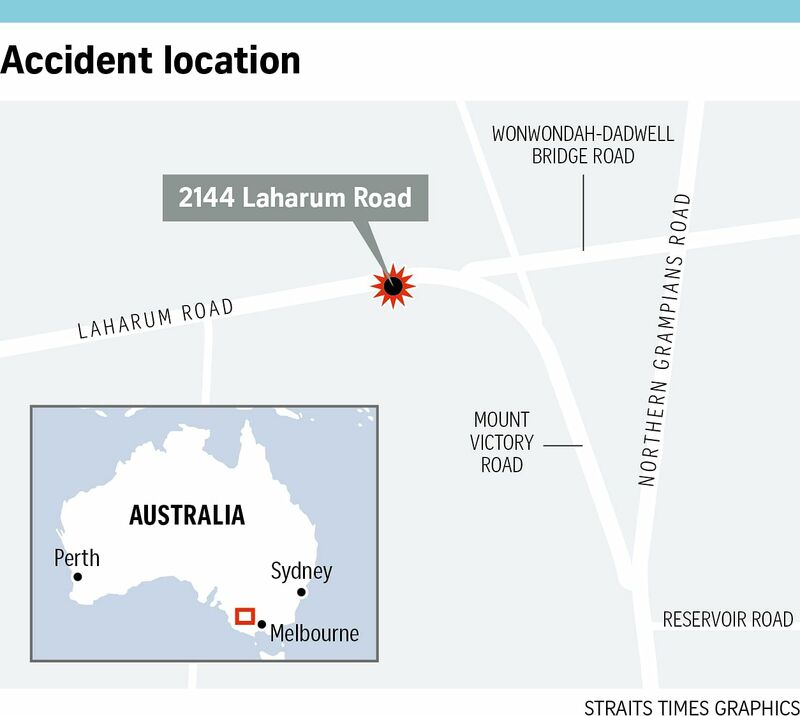 Four other Singaporeans, all women, were in his car when the accident took place in Laharum - about 300km from Melbourne - near the Grampians National Park, a popular tourist destination. The car in which the Singaporeans were in had crashed into another car near the junction of Wonwondah-Dadwell Bridge Road and Northern Grampians Road at about 4.20pm, reported local newspaper The Wimmera Mail-Times. It was not clear what caused the collision. A Victoria Police media spokesman who spoke to the paper said the man and the 23-year-old female passenger beside him suffered minor injuries. Three female passengers, all aged 23, in the back of the car were also injured. According to an Ambulance Victoria spokesman, one of the women had head, chest and spinal injuries, while another sustained head and leg injuries. Both had to be flown by air ambulance to different hospitals in Melbourne and were reportedly in critical condition. The third had neck and back injuries and was taken to a local hospital in stable condition. The driver of the second car was a 24-year-old Australian woman who escaped unscathed. In response to media queries, a Ministry of Foreign Affairs spokesman said the ministry and the Singapore High Commission in Canberra were aware of the accident. "We are in contact with them and their next-of-kin. The High Commission has sent officers to Melbourne to provide consular assistance to the Singaporeans.” the spokesman added.